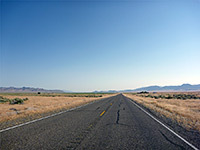 Nevada highway 305 crosses stark, empty land for 90 miles between Austin and Battle Mountain - the northern half (together with NV 376) of a 200 mile journey starting at Tonopah, designated a Scenic Byway by the American Automobile Association (AAA). For all its length the road follows the Reese River Valley, which is hilly for a while near the south end but is mostly flat, wide and uninhabited; there are no towns en route, just a few isolated ranches and working mines. Compared with NV 376, the land is a little more remote, varied and photogenic, yet both regions have archetypal Great Basin Desert scenery. NV 305 forks northwards off US 50 just outside Austin, and descends gradually into the valley of the Reese River, which originates in the Toiyabe Range to the south. The land is undulating, covered in sagebrush and completely undeveloped once past a few farms near the river; many ungated and unsignposted side tracks head off in both directions, good for primitive camping. 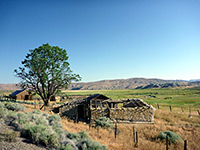 The road begins to climb after 20 miles, into the foothills of Ravenswood Mountain, where the land is a little moister and more overgrown, with meadows near the river and a few abandoned ranch buildings at intervals. More tracks branch off into the neighboring hills, part of a crisp, colorful landscape of weathered boulders, rocky outcrops, eroded cliffs and short green/yellow grass on the mountain slopes. 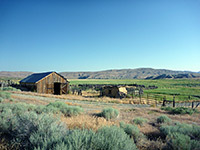 The valley opens out considerably after a short descent, and the hills are replaced by level land, partly agricultural, with a few ranches off to the west. A rest area marks the half way point, after which the road becomes completely straight apart from slight bends every five to ten miles, as it follows the valley northwards, passing a few junctions and approaching a small range of mineralized hills, site of several large copper mines. The highway ends with a slow descent to Battle Mountain (named after the nearby hills), on the far side of Interstate 80. Battle Mountain is the nearest town offering chain accommodation.